Since the ring of its first Tuesday bell in 2013, the Yellowknife Farmers Market (YKFM) made local food security a priority by creating a viable marketplace for local food-based businesses. More recently, we helped develop a draft Yellowknife Food Charter. A Food Charter sets a community mandate for broad-based action on local food security. It can bring people concerned about food security to work together. The Yellowknife Food Charter promotes a just and sustainable food system for all Yellowknifers. Developing a just and sustainable food system is possible with support and collaboration from individuals, community groups, the business community, and all levels of government who believe that strengthening local food-based businesses will bring improvements to our overall food security. make food distribution more efficient, eliminating food waste, promoting sole proprietorship in food production, or increasing access to land for agricultural pursuits. The Yellowknife Food Charter is a point of entry for groups and individuals to gather, generate ideas, and identify how to collectively respond and create projects that increase food security for Yellowknifers. The Yellowknife Farmers Market has received funding from the Yukon's Arctic Institute of Community-Based Research, the City of Yellowknife and the GNWT Anti-Poverty Fund to continue this important work during the fall and winter 2015-16. On January 15, 2016, the YKFM and a diverse range of partners officially launched the Yellowknife Food Charter with a giant celebration of food and community spirit. 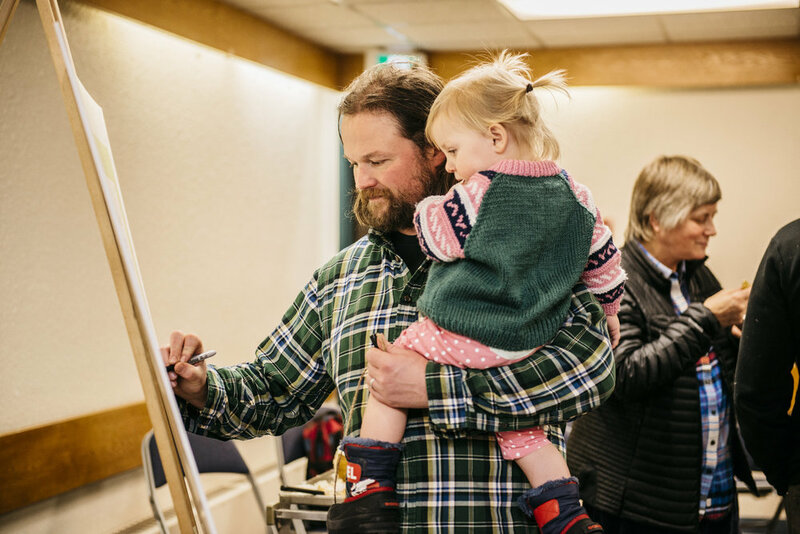 Over 125 Yellowknifers from all walks of life attended the celebration to enjoy all kinds of locally-made food, listen to live music, and learn more about the Yellowknife Food Charter. Public response to action on food security has been overwhelmingly positive, and members of the public made many suggestions for actions to take as we collectively move forward with the Yellowknife Food Charter. Many thanks to the musicians, caterers, organizations and members of the public who made the launch of the Yellowknife Food Charter a success! A Yellowknife Food Charter Coalition has been struck, and will drive actions to improve food security under the Yellowknife Food Charter. YKFM will continue to seek funding to support this work and will also continue to coordinate the actions of the Coalition for 2016-17, until the group decides how best to represent itself. Contact Us for more information or if you'd like to get involved. A group of interested individuals got together in December 2014 to draft a Yellowknife Food Charter, further drafting took place in March 2015. In July 2015, the City of Yellowknife officially endorsed the Charter. During the fall of 2015, we decide to take advantage of elections at the municipal, territorial and federal levels and put ads in the local paper reminding the public and candidates about the importance of food. We tried to raise awareness around food security for all Yellowknifers; we called candidates to talk to them about the Charter, we devoted a page on our website to the Food Charter, began highlighting food security news on our Facebook page, and set out to talk to businesses, organizations, governments, individuals about the Yellowknife Food Charter.